World Market, online at WorldMarket.com, is the place for furnishing and decorating the house and home. World Market offers a huge selection of home furnishings, home decor, kitchen and dining, bed and bath and more. Even find accessories for the home as well as an array of food and drink. World Market offers all sorts of furniture for every room including the dining room, living room, bedroom, home office, bathroom, as well as outdoor patio. So check out all the items for your house and home at World Market. First, stop by RetailSteal to find the best World Market coupon codes, World Markets promotions, and World Markets discounts. Available shipping methods with World Market are Standard Ground, 2nd Day, and Overnight and freight shipping. Costs depend on total weight of order. International shipping is not available at this time. See website for full details,exclusions may apply. Shop at Cost Plus World Market and enjoy free shipping on orders $125+. Click here for code. Shop the clearance at World Market to save up to 60% on select items. Shop at Cost Plus World Market and enjoy 10% savings on all orders. Click here for code. Save up to 50% on rugs from Cost Plus World Market. Click link to shop online. Shop at Cost Plus World Market to save up to 30% on bedroom furniture. Click to save. 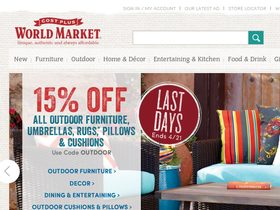 Act fast to receive a 20% discount on select outdoor furniture and accessories from Cost Plus World Market when you shop online today. Shop at Cost Plus World Market and enjoy free shipping on orders $150+. Click here for code. Sign up with your email on World Market and automatically get a 10% coupon code. Shop for lots of lovely gifts under $30 from Cost Plus World Market. Click the link to browse.